The fine folks at Abra-Ca-Debora contacted me to see if I would like to try a new product they have launched, their Diddy Dutch Pancakes. These mini pancakes are about the size of a 50p piece. And when I first saw them I thought, these would make a perfect after school snack for kids. The instructions on the bag say to heat for 30 seconds in a microwave and eat as is or dip them in some melted chocolate and sprinkle with nuts. The pancakes are puffy and light and utterly moreish, and were so scrummy with my fast dipping sauce. To heck with the kids, eat them yourself! 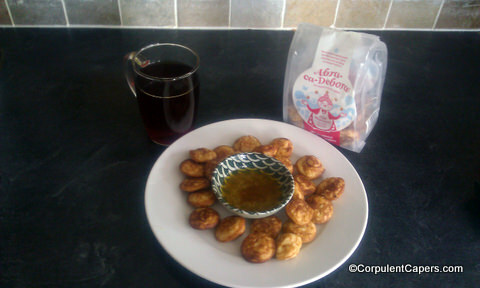 The nice people at Big Fish, Abra-Ca-Debra’s PR Company have promised me another 5 bags of these delicious treats to give away to 5 readers of this blog (don’t worry dear readers I will not enter and try to win). Simply leave a comment below, telling us what you would most like to dip your Diddy Dutch Pancakes in. The deadline for entries is midnight GMT Saturday 13th July 2013. The prize is one packet of Abra-Ca-Debora Diddy Dutch Pancakes, as shown above, and includes free delivery anywhere in the UK. Corpulent Capers received review samples from Big Fish. i’d dip mine in warm nutella.. mmm! These look ace, and deffo wouldn’t last long in our house as we all love pancakes, we would be dipping them in maple syrup, yum! I would dip in honey. Has to be strawberry jam and cream! my kids have nutella chopped banana whipped cream and chopped nuts sooo yummy!!! with syrup, banana and ice cream, yum! Melted chocolate & flaked almonds – Yum! I would dip mine in condensed milk!! I dip it into some softened chocolate Philly mmmm…. PEANUT BUTTER AND BLUEBERRY JAM. I would choose proper Canadian maple syrup! These remind me of the teeny pancakes they sell at burger king for a dessert – i love those and can easily eat 10+ in one sitting! Lime and honey dip. Awesome! Bit of a cheat really but I would like potted shrimp. Cheat because it will not dip and you will need a knife but a small price to pay for total summer wonderfulness! Warmed golden syrup or nutella (nuked in microwave for a few seconds) would be my dipping choice! melted Mint and Chocolate dip, with a drizzle of raspberry sauce. Warm runny chocolate then dipped in dried desiccated coconut. Chopped banana and toffee sauce – Abracadebrabanoffee! I would dip them in a mixture of chocolate, golden syrup, melted marshmallows and butter like the base of a Rocky Road mixture! I’d dip mine into vanilla cream – I love cream! I would dip them in Nutella, yum! Chocolate spread and peanut butter swirl. Chocolate..it always has to be chocolate! oooh this is a big naughty, but i would love to just spread the top with a bit of smooth peanut butter and then dip in either strawberry jam or lemon curd…. my mouth is watering just thinking about it! I would dip mine into sauce made from a mix of melted peanut butter, pinch of cinnamon and a dollop of wasabi for a bit of a kick! Hot Chocolate sauce – delicious! White chocolate and peanut butter! In spiced apple compote, YUM! I wouldn’t dip them, I’d soak them in warmed Jack Daniels, the honey variety!!! Has to be maple syrup. Love it. Love to dip them in double whipped up cream. White chocolate with blue raspberry sauce. I’d dip mine in Lime Curd and White chocolate spread! I would dip mine in golden syrup or maybe coffee. My family have a mixture of golden syrup or heated chocolate spread. Chocolate fudge sauce and toffee ice-cream. Yum! Golden syrup – every time! A mix of warm golden syrup and rum! Nutella or butter and sugar mmmmmm….. I have mine with peanut butter. Melted chocolate or warm syrup. They’re both amazing!! Maple syrup. They look delicious. I would dip them in melted white chocolate! Yum. Lemon juice and then sugar! Lemon juice and then brown sugar! As a fine gentleman, I would have mine with Bacon and Ice Cream. A huge bowl of maple syrup – gourmet heaven baby! Peanut butter, with some sliced banana.